1. Cut squash in half and preheat oven to 425 degrees. 2. Scoop out center of the squash – all the seeds and pulp. 3. Bake squash in oven for 35 minutes at 425 degrees in about a 1/2 inch of water on a baking sheet. 4. Cook your bacon until crispy while your squash is in the oven, then crumble. 5. Chop your onion and broccoli, and cut your tomatoes in half if desired. 6. Remove squash from oven and remove “spaghetti” from the skin by using a fork to scrape the sides down. This can be done a few minutes after the squash comes out of the oven so you don’t burn your fingers. 7. 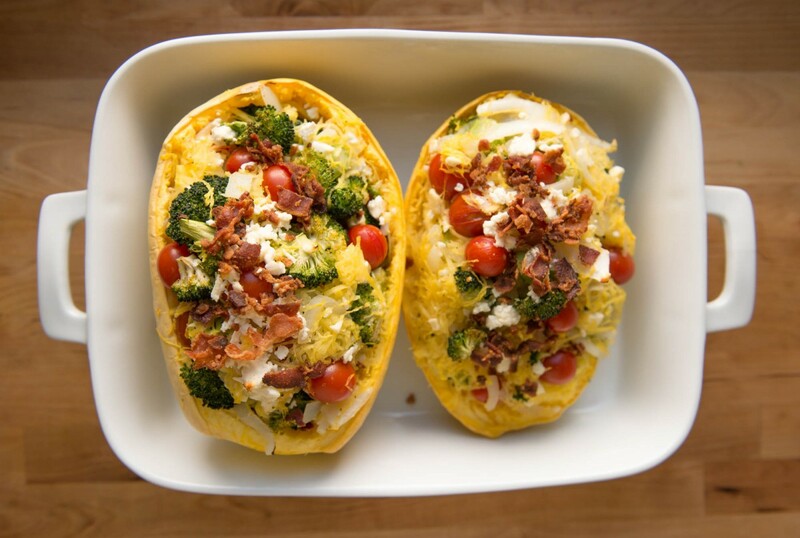 Mix shredded squash with veggies, and add in your feta and bacon. 8. Return to squash shells and bake for an additional 15-20 minutes at 375 degrees. Remove from oven and enjoy!